The cultivator removes the weeds between rows of crops. Cultivators can have straight or curved 'teeth', spring 'teeth', or disks. The width of the cultivator can be changed to fit through the rows. 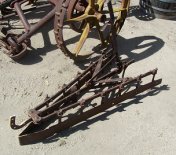 This is a single-row, spike tooth, horse-drawn cultivator. By the 1850's, hundreds of different types of horse-drawn cultivators were made. By the 1890's this small cultivator was replaced by larger, riding cultivators. This is a single row horse drawn spike tooth cultivator. The height of the spikes is adjusted with the clamps which hold them in place. This allows them to all be at the same level. The spikes can be turned to equalize wear. The lever controls the width of the cultivator so it can fit between to rows of crops. The handles are missing. The metal plate on the tines controls the depth of penetration. It is a recent addition as it is welded on in a gas/electric method.